On the streets of Alexandria, Egypt, in the 4th century, you might be asked, homoousios" or "homoiousia"? It would be no exaggeration to say that your life at that moment may have depended upon a theologically and politically correct answer which would, of course, be "homoousios". If you were a native Alexandrian, you would likely know the answer. However, a new comer to the city, likely arriving by ship, you would have been well served by the ship's captain who might be knowledgeable enough to warn you before you set foot on land. Such was the power of the early Church in the 4th century. The problem with attempting to clarify, clarifying being little more than gross theological speculation, and then promulgating religious dogma based on that speculation, as in the case of the early Church fathers attempting to describe the nature of God, something that can not be proven as fact, but must be taken on "faith", is that someone will always question it or take an opposite position. We need only look at the three Abrahamic religions (those monotheistic faiths emphasizing and tracing their common origins to Abraham),Judaism, Christianity and Islam, to realize how inflexible religious doctrine can cause human suffering and loss of life. Thus one question will always remain: Who is really right? Perhaps the best answer is: In the end, it does not really matter because it is all words of men and is only speculation anyway. 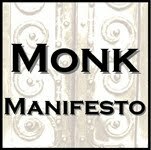 The remarkable thing about the desert fathers, following their own spritual path before the early Church became organized and eventually took control of the Egyptian monasteries, was that the monks practiced their own individualized spirituality without a cloak of dogma or interference from the organized Church. And it appears from their sayings that they were remarkably successful in their efforts to experience communion with the Divine. Unfortunately as the early Church fathers began formulating and structuring doctrine that was very specific in describing what beliefs concerning the nature of God constitute a "true" Christian and imposing those specific beliefs on the monasteries during the 4th century led to dissension among the Neoplatonic monks educated in the Alexandrine schools and the uneducated monks. Eventually the worldly politics of theological speculation invaded the cloistered world of the desert fathers. Around this time (4th century) a new definition for the word "heresy" emerged. Traditionally up to that time heresy meant a choice or opinion, but as a Christian orthodox position (or "true belief") was established, heresy eventually came to mean an incorrect theological belief. Anything not Orthodox Christian was pagan. From the Orthodox Christian viewpoint, there was no middle ground. Anyone, monks included, not "Christian" in the emerging orthodox sense were heretics and became targets for persecution. Ironically an individual on a most devout spiritual path leading to communion with the Divine, could be a heretic in the eyes of orthodox Christianity if they did not profess the true belief, leading one to wonder if perhaps even God, himself, could be a heretic! Sadly, the monks became sharply divided leading to open hostilities. Those monks who were unwilling to accept or adapt to early Church doctrines concerning the precise nature of the Divine were banished from the monasteries in Egypt in what became known as the "Trinitarian controversies" and later the Christological Controversies. 1. The Christian tradition universally taught that God was one, yet most Christians also believed in the concept of the Trinity (three persons in one God: Father, Son, and Holy Spirit). 2. Much theological controversy surrounded the attempt to reconcile these two ideas and theologians turned to the intellectual systems of Greek philosophy to give them a framework with which to approach this difficulty. 3. Byzantine Christians believed that their individual salvation depended on correct belief, so it was absolutely crucial to find the correct answer--and there could be only one correct answer. "In addition, if any writing composed by Arius should be found, it should be handed over to the flames, so that not only will the wickedness of his teaching be obliterated, but nothing will be left even to remind anyone of him. And I hereby make a public order, that if someone should be discovered to have hidden a writing composed by Arius, and not to have immediately brought it forward and destroyed it by fire, his penalty shall be death. As soon as he is discovered in this offence, he shall be submitted for capital punishment...— Edict by Emperor Constantine against the Arians"
The purpose of a creed is to act as a yardstick of correct belief, or orthodoxy. The creeds of Christianity have been drawn up at times of conflict about doctrine: acceptance or rejection of a creed served to distinguish believers and deniers of a particular doctrine or set of doctrines. With the Council of Constantinople (381) the Trinitarian controversy was settled. However, questions regarding the nature of Christ remained; what was the relationship between his human and divine natures: These issues were discussed and debated for years and the decision reached at Chalcedon (451) ultimately split the empire into two religious groups (Eastern Christianity/Western Christianity) which have never been reconciled. Hypostasis had come into use as a technical term prior to the Christological debates of the late fourth and fifth centuries. Before there were Christians, the word was used in Greek philosophy, primarily in Stoicism. The Nicene Creed was one measure of a "true" Christian. Christology (from Greek Χριστός Khristós and -λογία, -logia) is the field of study within Christian theology which is primarily concerned with the nature and person of Jesus Christ as recorded in the canonical Gospels and the epistles of the New Testament. The Christian doctrine of the Trinity defines God as three divine persons (Greek: ὑποστάσεις):... the Father, the Son (Jesus Christ), and the Holy Spirit. The three persons are distinct yet coexist in unity, and are co-equal, co-eternal and consubstantial (Greek: ὁμοούσιοι). Put another way, the three persons of the Trinity are of one being (Greek: οὐσία).... The Trinity is considered to be a mystery of Christian faith. Consubstantial" describes the relationship among the Divine persons of the Christian Trinity and connotes that God the Father, God the Son, and God the Holy Spirit are "of one being" in that the Son is "generated" ("born" or "begotten") "before all ages" or "eternally" of the Father's own being, from which the Spirit also eternally "proceeds." Filioque (Ecclesiastical Latin: [filiˈɔkwe]), Latin for "and (from) the Son", is a phrase found in the form of Nicene Creed in use in most of the Western Christian churches. It is not present in the Greek text of the Nicene Creed as originally formulated at the First Council of Constantinople, which says only that the Holy Spirit proceeds "from the Father"
Together with papal primacy, differences over this doctrine have been and remain the primary causes of schism between the Western and Eastern Orthodox churches....The Filioque has been an ongoing source of conflict between the East and West, contributing, in part, to the East-West Schism of 1054 and proving an obstacle to attempts to reunify the two sides. Controversy and Banishment in Paradise: Promulgating on the Nature of God and the Afterlife.